Discussion in 'Star Wars: Books & Comics + Legends' started by SWNN Probe, Oct 18, 2018. 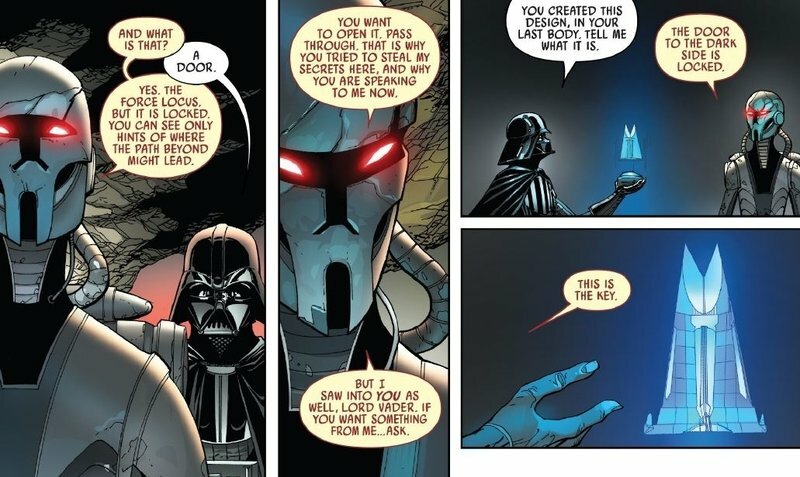 When we left the Dark Lord of the Sith in the last issue, Vader had killed Roggo who was taken over by Momin (an ancient dark sider who takes possession of others through his mask, a powerful dark side relic). Before his death however, we caught a glimpse of his creation, a sight familiar to every Star Wars fan. 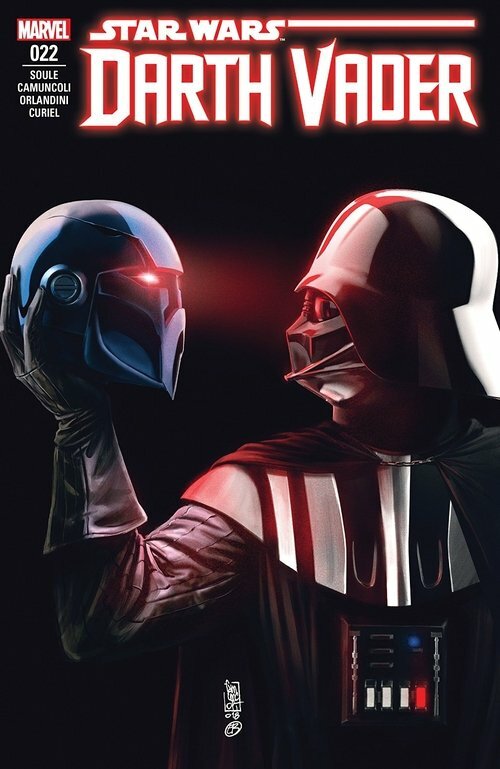 As this issue opens, Vader takes the mask in the cave where he meditated, a nexus of dark side energy, and communicates with Momin’s mask, which reveals mysteries of the dark sider's past. As a youth, Momin was obsessed with creating art of various forms using the influence of the dark side. After being ostracized for his dark practices, Momin was saved by Darth Shaa who took him for apprentice. While he learned much from her, Momin never saw her as his master. He would never be so bold as to consider himself a 'master', but he definitely did not view Shaa as a superior. To prove that he is second to none, he killed her. He never took an apprentice, because he had no time to teach with all the things he wanted to learn. Momin studied the Force and the dark side, visiting many sacred sights, until he came to the conclusion that the Force is the only worthy audience for his art. If he could create something worthy of the dark side, he could become worthy himself. And his idea of a masterpiece is as twisted as you can imagine. But, the Jedi came and disrupted Momin's evil plan. He lost control, missed the crucial moment, and died, while possessing his own mask. Momin killed many people in the process; however, the dark side requires a better tribute. The dark side is sacred, but it is also hungry. You must feed it or it will feed on you. 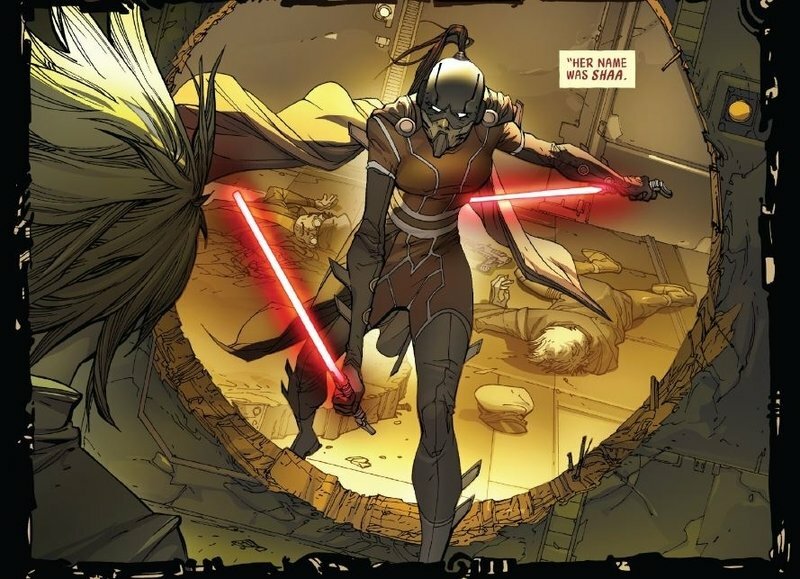 We see how the mask/Momin eventually took over one of the Jedi that defeated him, and, in the present timeline, we see him attempting to do the same to Vader as the story unfolds. But unfortunately for Momin, Vader is too strong. 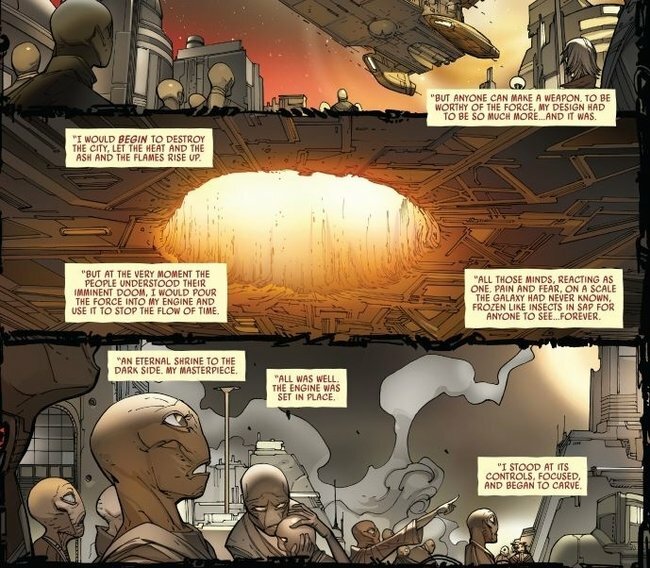 Soule and Camuncoli then take us outside, to Mustafar's surface, where a group of aliens from the first issue in the story arc are searching for the remains of the ship they saw. They cannot find anything, and they are just about to return to their anxious father, when Vader attacks them. He easily slaughters most of them, and while the rest run away he catches one and forces Momin's mask on him – now, Momin has a new body through which to create his first truly perfect dark masterpiece. In the cave, while Momin would like to chat, Vader has no time for such nonsense. The cave represents a Force locus that is closed. Momin reveals that the fortress he has designed is the key to opening it; it will tune the energy of the locus enabling Vader to take the first step in using the dark side to pierce the veil of time, between life and death – he will be able to see his wife again. Understandably, Vader isn’t very trusting, having been lied to about the dark side's abilities before, and he warns Momin not to betray him – in his usual style. Momin just wants another opportunity to create and promises that he will indeed create masterpiece. There are two stars of this issue: Camuncoli’s art supported by Curiel’s perfect coloring and of course – the character Momin. The art of Momin’s story is particularly stunning, managing to convey both a young man’s fanaticism and strange elegance. It contrasts beautifully with the harsh Mustafar environment and fight scenes. I always liked Camuncoli’s drawing, but he and Curiel really outdid themselves in this issue. 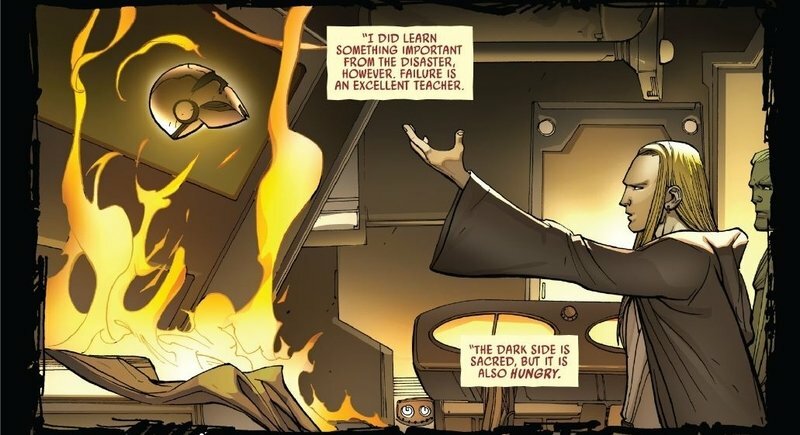 The dynamic between Vader and Momin is also interesting. While Vader received insight into Momin’s life, Momin saw into Vader as well and knows his greatest desire. He knows exactly which carrot to dangle in front of the Dark Lord of the Sith who still holds onto his unfortunate love for his dead wife. 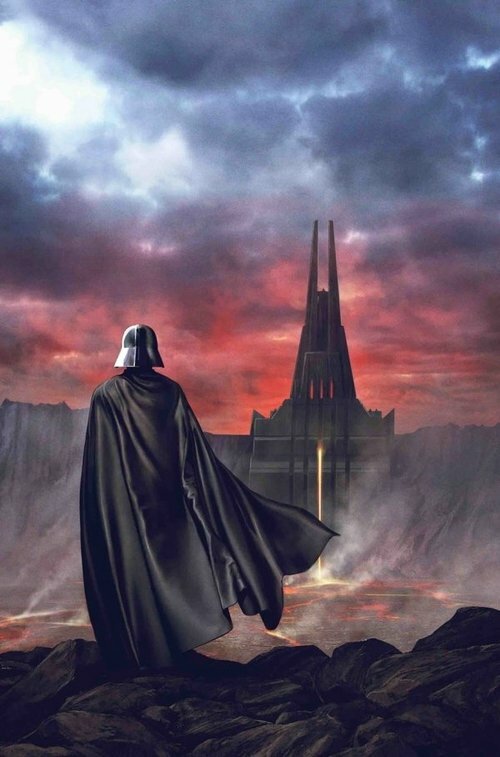 While we have known for some time now that Mustafar had a strong dark side connection, now we also know that it is possible for that connection to become even stronger – once Vader’s Fortress is built. We also learned that Mustafar was not always the fiery planet we know now. Both these things provide possibilities for future story tellers. But, mostly, I am interested in the relationship between two dark side users. We know that the fortress was eventually built (as we see it for the first time on screen in Rogue One). Did it grant Vader even a hint of what he wanted? A deeper understanding of the Force? While Momin seems eager to create, his relationship with Vader isn’t as simple as the relationship between an artist and a patron. This man cheated death to be able to create, he certainly isn’t some humble servant. He might get the better of Vader in some way yet. I keep repeating myself every time I review one of these issues, but I have to. This is possibly the best comic run since Marvel took over the publishing rights again. 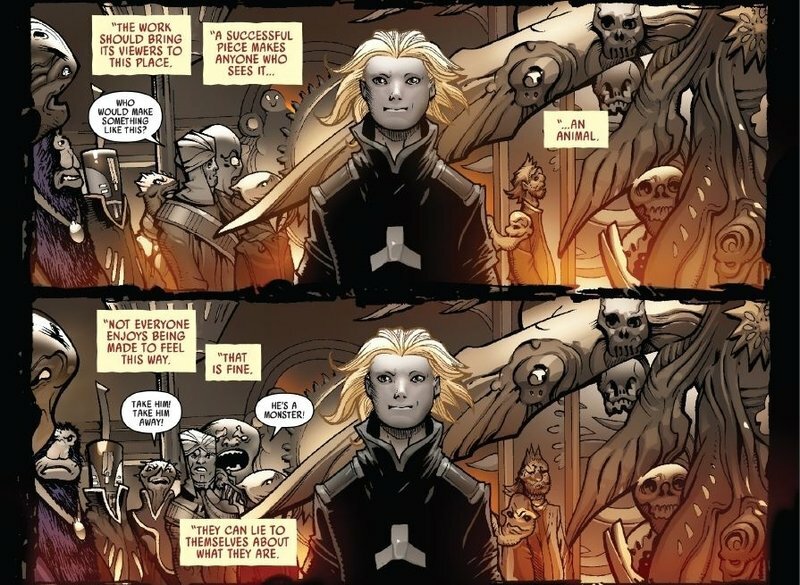 Charles Soule manages not to just further develop the characters we know and know well, but also to expand the lore in interesting and unexpected ways. The story of Darth Vader gains weight with every passing page, which is an especially outstanding achievement since Vader is probably the best developed character in the Star Wars universe already. And with every turn of the page, you want to know more. Part of me is sad that this run will end with issue #25, but I am also happy that this brilliant series will not outstay its welcome. If the last three issues are this good, we will probably be waiting for some time for a comic to surpass it. • Darkness rises above MUSTAFAR as the brutal designs of LORD MOMIN begin to take shape. • But the planet’s inhabitants cannot take this desecration lightly, and shape plans of their own. 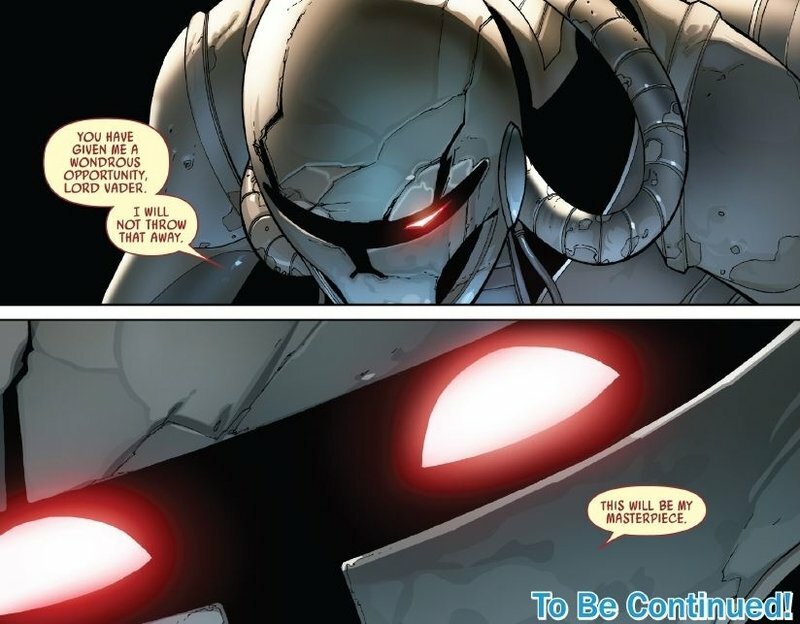 I got some Scourge of Malachor vibes from this comic. I don't know if they are trying to tease or trick fans with this but it is possible we just met the young version of a really important fan-favorite character. Did we just meet a young Revan? If we did, this could be huge for the character's new origin story and for opening a new chapter of the canon Star Wars saga. I wonder if Mustafar is the place that Momin destroyed in the flashback, and if that's why Mustafar is molten in the "present". I how Momin ended up preserved inside his mask, and what sort of entity his essence is.